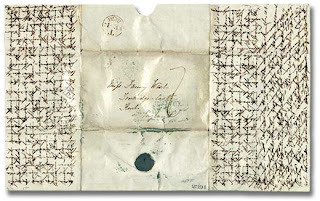 During the 18th & 19th centuries, in an effort to conserve the expense of paper and postage, cross-writing was often used. Although it seems rather cryptic, writing in this fashion was a great way to economize. 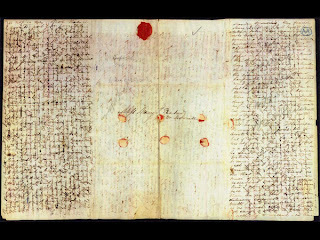 You see, prior to the Penny Postage in 1840, one of the factors affecting the cost of posting a letter was the number of sheets of paper used. Using two sheets would double the cost, so when one would suffice with cross-writing the writer would essentially get two for the price of one. 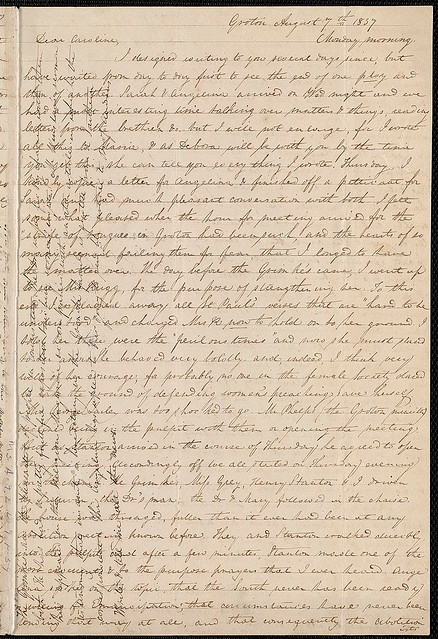 How it works: After a page of writing had been completed, often when both sides had been filled, the write turned the page 90 degrees and continued writing, adding a second layer of text. To decipher the letter, one simply must read in the direction of the text. The reader's eye tends to naturally tune out the perpendicular lines and can follow what was written. "When you get to the end of a notesheet, and find you have more to say, take another piece of paper—a whole sheet, or a scrap, as the case may demand: but whatever you do, don’t cross! Remember the old proverb 'Cross-writing makes cross reading.' 'The old proverb?' you say, inquiringly. 'How old?' Well, not so very ancient, I must confess. In fact, I’m afraid I invented it while writing this paragraph! Still, you know, 'old' is a comparative term. I think you would be quite justified in addressing a chicken, just of of the shell, as 'Old boy!' when compared with another chicken, that was only half-out!" 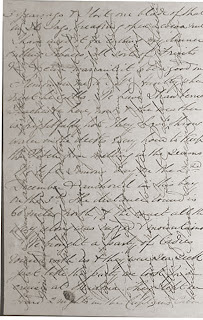 The following are examples of cross-writing. 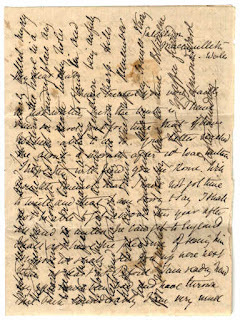 In this image and the next observe how the fold of the letter creates the "envelope". I have treated you very badly in not writing but the truth is I have been so hard put for time that I have not been able to do so. Your letter reached me, about a month after it was written. I hope this will find you in Rome. Will you tell Samuel that I have not got time to write and that I am sorry to say I shall not be able to get abroad this year after all and so unless he can get to England, I shall not have the pleasure of seeing him. I suppose we shall see you up here next term at least at Oxford. You already know my eyes have been bad and have thrown me back considerably. I am very much afraid I shall only turn out a second after all, but still I must work while there is hope." 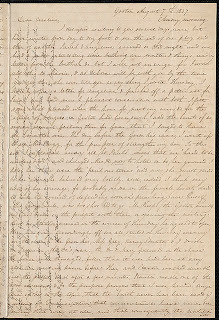 Writing over the course of three days, Austen acknowledges receiving another letter from Cassandra in the meantime: "You are very amiable & very clever to write such long Letters; every page of yours has more lines than this, & every line more words than the average of mine. I am quite ashamed—but you have certainly more little events than we have." The letter is full of little events: "Mr Waller is dead, I see;—I cannot grieve about it, nor perhaps can his Widow very much," and "I want to hear of your gathering Strawberries, we have had them three times here." She reports that she is not enjoying Walter Scott's newest creation Marmion, an epic poem about a sixteenth-century battle between the English and the Scots, although she suspects she should be. Caroline Weston describes making calls with Mrs. Maria Weston Chapman on Henrietta Sargent and Mrs. Helen Benson Garrison, where they met Mr. Garrison and George Thompson. She tells about the call of Mr. [John S.] Kimball in quest of a teacher for the Canaan School [Noyes Academy? ], Caroline's suggestion of Sophia Davenport for the position, her uncertainty, her decision against it, and later makes a tearful change of mind, though too late. She gives an account of a farewell metting for Mr. and Mrs. David Lee Child at the home of Ellis Gray Loring. "The 'watch' [given to Mrs. Child by abolitionist friends] was there, the Bible too & the inscription & the letters"--the letter from the ladies of Salem and Lynn was especially beautiful. Mr. Thompson offered a moving prayer and "there was much weeping & feeling." She describes seeing the Childs and Thompson off: "Mrs. Child was pretty much used up and seemed much depressed. The fears that Thompson will not get back safely...The impression in Boston that he will be killed here is gaining strength daily." The Transcendentalist philosopher wrote to her sister, Mary, telling her that she was not in love with Horace Mann, knowing that Mary was. "Elizabeth explained that her feelings for the 36-year-old, recently widowed politician, whose hair was said to have turned white in a matter of weeks as he mourned his young first wife: 'his situation, his grey hair—his sorrow have ever precluded from my imagination" the possibility that she would fall in love.'" Mary ultimately married Horace Mann and her other sister married Nathaniel Hawthorne. 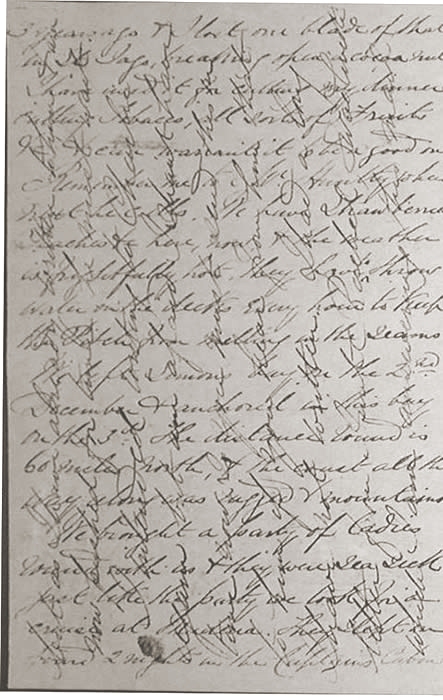 Have you ever heard of or tried cross-writing? 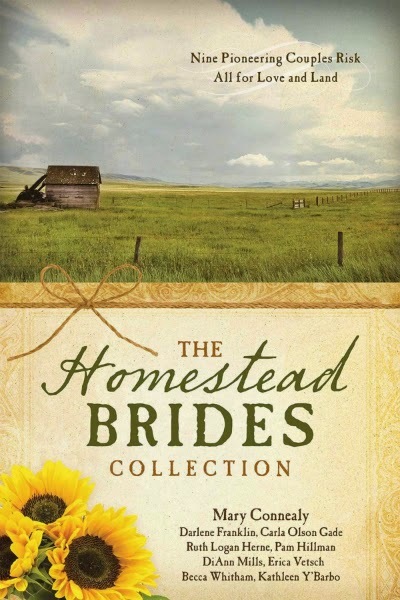 The Homestead Brides Collection (Barbour, February 2015, ECPA Bestseller) Through nine historical romance adventures, readers will journey along with individuals who are ready to stake a claim and plant their dreams on a piece of the great American plains. While fighting land disputes, helping neighbors, and tackling the challenges of nature the homesteaders are placed in the path of other dreamers with whom romance sparks. And God has His hand in orchestrating each unique meeting. Elsa Lindquist applies her scientific theories to growing trees on the Nebraska plains, intruding on a handsome homesteader’s hard work and experience. Will their dreams come to ruin, or will love prove their success? New Englander Carla Olson Gade writes from her home amidst the rustic landscapes of Maine. 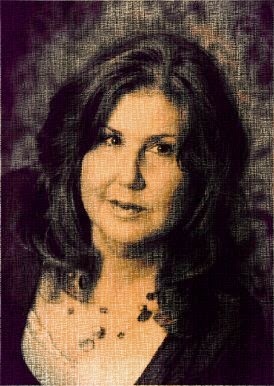 With seven books in print, she enjoys bringing her tales to life with historically authentic settings and characters. An avid reader, amateur genealogist, photographer, and house plan hobbyist, Carla's great love (next to her family) is historical research. Though you might find her tromping around an abandoned homestead, an old fort, or interviewing a docent at an historical museum, it's easier to connect with her on her blog, Adventures of the Heart. I have heard of cross writing before. Came across it in my historical research. It's a pretty interesting bit of history, isn't it? I've never tried it, but I've spent hours trying to READ it in our local historical archive. 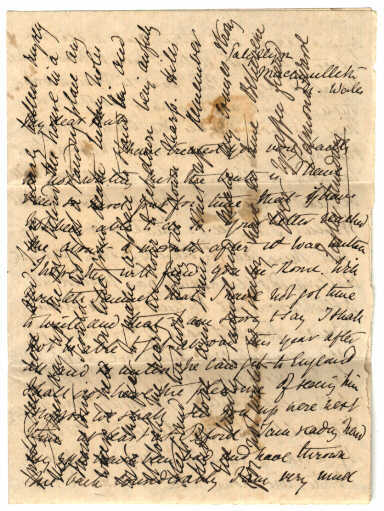 I love reading pioneer letters, but that cross-writing takes patience. I had no idea it was so wide-spread. Fascinating post, Carla. I'd heard of it but had never seen examples before. Great post! What an interesting post, Carla. The skill of cross writing, and the stories and examples you have shared are so interesting. Thank you! Carla, fascinating information! Great examples of cross-writing. Thanks for your post. Carla, I'd never heard of cross-writing. Thanks for a very interesting, informative post. Great post on a little-known gem.